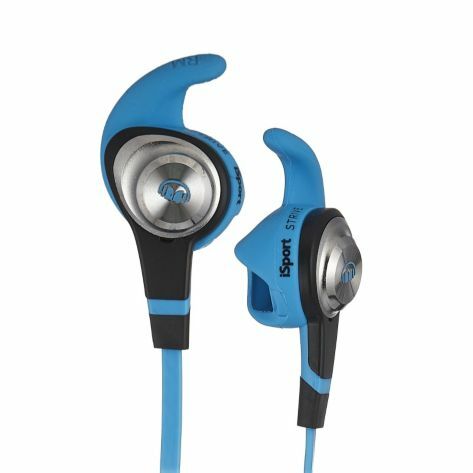 The Monster iSport Strive are in-ear headphones that are specially designed for the active among us. A special rubberised ‘clip’ that goes around the in-ear speakers ensures that they fit well into your ear, stay there, and do not pop out, no matter how hard your work out is. On the face of it, they look pretty much like most sports focused in-ear headphones. Then you start to look close, and notice the subtle but good touches. They come with a tangle free flat cable, that features a call accept button, which also lets you play/pause any music you’re listening to. The 3.5mm end features a connector that feels more rugged than most. On the business end, you notice the rubber inserts, that go inside your ears. They are soft, and the whole experience is quite light on your ears. Included in the carry case is also a clip that can be used to clip this to your shirt in case you want to do that. This takes a little getting used to. These don’t just go in like normal in-ear headphones. I started off by not looking at the instructions, and trying to twist these into my ears. They stuck, but they felt bad. Something wasn’t right. I had packed these with me, without the instructions, and now I couldn’t really use them. I came back, looked at the instructions, and realized I had made a mistake. To put them in, you have to squeeze the tip towards the speaker, and push them into your ear. It takes a few tries to get right, but once you get it, it works. You know you have done in right because they go in, feel good, and do not insist on falling straight out. The medium sized worked great for me. I took these bad boys running. I do not normally run. Okay, I run while playing other sports, but I do not just randomly go on runs. I would like to, but I don’t. However, these headphones felt and looked good enough for me to just go off for a 2 mile run. Was it good? Yes. Did they come out? No. Did they feel like they would come out? No. A good snug fit, which sits there in comfort, giving you the music you need for your work out, run, cycle, or whatever you get up to, without the fear of them falling out, or feeling uncomfortable. I kept them in for a couple of hours straight, and when I took them out, they left no uncomfortable after taste. Job well done! These provide partial isolation, which means if you are running by the road, or in a park, you will be able to hear things around you. Personally this is a good thing, as it means you can be aware of things around you, and still enjoy good music. As far as music quality goes, these will not blow your mind, but they are pretty impressive. They provide a well balanced sound experience, very slightly heavier on the bass side, but that is what one normally looks for during a run. A bit of good music, a bit of beat, and everything comes together. These boys work well on that front. Calls sound good too, though you’d probably not want to take calls while running. People might think you’re a weirdo with all that heavy breathing. More information on these is available from the Monster website. They can be bought from the QVC website. They retail around the £60 mark. A good set of headphones, designed with the active in mind. They promise to stay in, and they deliver, while giving you good comfort too.